Fall is just around the corner and for gardeners in the southwestern US it is a great time to think about planting perennial shrubs. This is also a great time to plan out your landscape for next year including preparing for more drought! Planting in fall brings a little extra free water from the rain and milder temperatures for new transplants who are trying to get established. You can still grow beautiful trees and shrubs in a low-water garden. Here are a few of my favorite flowering shrubs. They all have beautiful blooms and are all drought tolerant too. I have written about them before, so I'm providing a quick rundown of the basics and a link to longer articles about each plant. Happy gardening! 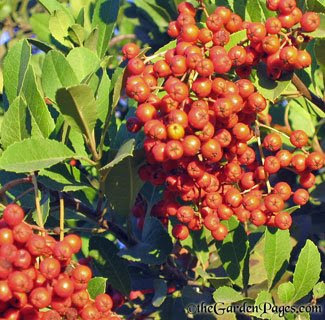 Toyon is also called California Christmas Berry or Christmas Holly or Heteromeles arbutifolia. These beautiful shrubs are prized for their bright red berries and deep green leaves. Chilopsis linearis, or Sweet Desert Willow make a great alternative for traditional flowering cherry trees in dry gardens anywhere in the western US. The exotic flowers can appear from spring to fall and drip in giant clusters. Each flower can be about three inches long and an inch wide with colors ranging from white or pastel pink to hot pinks or deep purple. Like cherry trees, they are deciduous, but Desert Willow develop exotic seed pods with cottony down before giving up for the winter. They can be left as large shrubs, or trained into multi-trunked trees. Crape Myrtle: Their Latin name is Lagerstroemia and the most common kinds sold here are l. indica or a hybrid of l. indica and l. fauriei (Japanese Crape Myrtle). 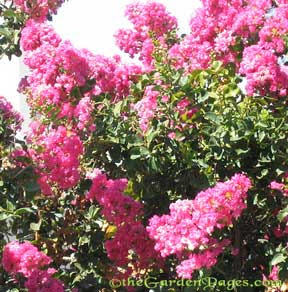 They are also called Crepe Myrtle, or Crapemyrtle. These deciduous trees can bloom anytime from spring through fall. Colors come in bright white, dusty pinks, neon reds onto pink and purple shades, plus everything in-between.